5 Minutes for Fido: It's Super Dog Sunday: Let's Go to the Hop! The Human Momma is up cookin' more for the Human party she and Papa are off to soon...so I want to thank you for hostin' a fun day! How did you two dogs get to be so good? Mom is a staunch Pack Leader type who gives out major loving and great homemade peanut butter cookies when we behave nicely. Did you see her recipe at All Things Dog Blog? We can't wait to dig in this afternoon! While I would rather be watching dogs play than giant men, living in Packer country I have to side with the boys in Green and Gold. 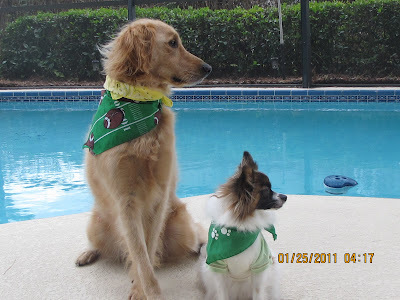 Oliver and Tanner, you look like you're waiting for the kickoff!! Mom commanded "Profile View" and we just followed orders. Aren't you impressed? Happy Blog Hop! I like those bandanas! Go Packers! Great shot and I love how you have your paws crossed - so sweet! Thanks for the fun blog hop today and enjoy those cookies - you two deserve them! Love how the Golden's front legs are crossed! So cute. You guys look great! I especially love how you're both looking in the same direction.